Time to fill a few – thousand – countersink holes! We use 3M Premium Marine Filler and its associated crème hardener for this purpose. John and RJ prefer a yellow body compound spatula to my flexible putty knife, but either can apply the material to the hole. In theory you make a first pass laying material into the hole, followed by a second one back and 90 degrees from the first. In fact you will, or at least I do, soon discover that three or four swiped removes the excess from the surface surrounding the hole while also filling the hole flush with the surface. We mask off the seams with narrow blue painter’s tape to ensure that the Premium Filler does not find its way onto the 3M 5200 lying therein. Yes, it will appear to adhere, but be forewarned, it will not and your subsequent “beautiful” bottom paint will end up have splotches everywhere that the 5200 shed the filler. 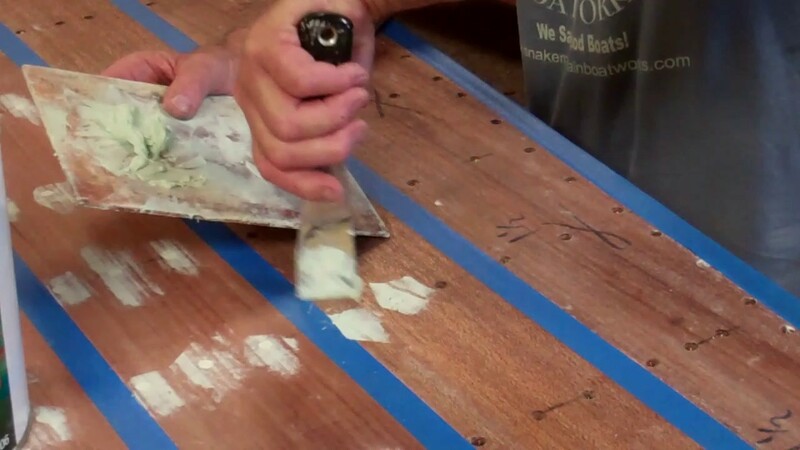 Allow the first coat to cure, apply a second, and then remove the tape, which reveals more rows of empty countersinks. Yes, the fun is near endless. Once both sides are filled, fair with a longboard sander and 80 grit, seal all of it with at least two coats of CPES, and begin laying on what will be five coats of Interlux 2000E Two-Part Epoxy Primer (Barrier Coat), followed by the bottom paint of your choosing.